This is something for the specialist, but intriguing for all that. Grace’s Guide bills itself as “the most comprehensive source of information on the engineering industry in Britain between 1750 (the start of the Industrial Revolution) and the 1960s”. Put together by ‘volunteers’ in wiki form, the site (which started life in 2007) is a reference guide to personalities, products and companies in engineering, taken in the main from a wide range of original journals, directories and reference guides, as well as web resources. Entries are are in the form of bullet-point histories, with numerous links, and references assiduously cited. 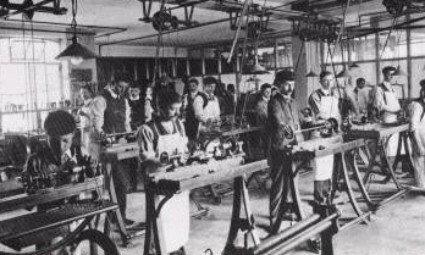 Though much of the site is dedicated to the motor industry, shipbuilding, aircraft and such like, but there is also some information to be found on the early cinematograph industry. There isn’t a page dedicated to the cinema industry, nor a keyword to use so far as I can see, but enter ‘cinematograph’, ‘bioscope’ or ‘film’ in the search box, and you’ll find plenty. Some of the records are no more than company names taken from directories (particularly the 1914 Whittaker’s Red Book and a 1922 British Industries Fair listing). But a few more give much more detail, and for the film historian it is possible to find useful information on some familiar (and not so familiar) names and their careers in engineering outside film – a useful reminder that for many their professional lives were not necessarily wholly circumscribed by film. Among the people covered I’ve found Birt Acres, William Vinten, and Ernest Moy, while among the businesses there is J.A. Prestwich (rather better known for motorcycles than the cinematograph equipment that the company also produced), W. Butcher & Sons, the Williamson Kinematograph Co. and Werner Frères (another business operating on the motorcycle-motion picture interface). There’s a huge amount that could be there that isn’t (yet), there are no illustrations, and some of the film information comes from familiar sources (Screenonline, Who’s Who of Victorian Cinema, Wikipedia), but if you know what you’re looking for, this is a resource to keep an eye on (or, indeed, to contribute to). You may not be aware that there is a book written about the history of Vinten. Images of Success, written by Stuart Sansom and Luke Vinten in 1993. A copy was given to all those who worked at Vinten at that time but I doubt it is or was commercially available. I know of it – I even saw a copy once – but I don’t own one. I’ve always found Vinten’s history interesting. There’s a real thrill in seeing a name from the early cinema period still so prominent in the broadcast industry of today. I do have my copy – I worked for Vinten for 30 years. If there is any particular aspect that you are interested in I can scan it for you.